You'll remember that Arizona SB 1070, or the "papers, please" bill, is the new law passed by the legislature targeting Latinos. If signed by Arizona governor Jan Brewer [R.], it would allow any law enforcement officer to stop you without due cause and ask you "papers" to prove you have the right to be in this country. What's not really being covered in the mainstream media is the fact that the bill's sponsor, Arizona State Senator Russell Pearce, has been tied to white supremacist groups on various occasions and also has been known to have a violent and volatile temper. On his website's Illegal Immigration page, Pearce has a quote ... by himself, of course: "Illegal is not a race; it is a crime." I'm sorry ... what? That makes no sense whatsoever. I've got to be honest, Friends: this guy is so terrible - with his "For Faith, Family and Freedom above all else" (but, only if you're white) rhetoric - that I can't even stomach linking you to his website. Cardinal Roger Mahony of the Archdiocese of Los Angeles denounced state Senator Russell Pearce's SB 1070 on Sunday, likening the bill to the police state tactics of Nazi Germany and Communist Russia. "I can't imagine," wrote Mahony, "Arizonans now reverting to German Nazi and Russian Communist techniques whereby people are required to turn one another in to the authorities on any suspicion of documentation. "Are children supposed to call 911 because one parent does not have proper papers? Are family members and neighbors now supposed to spy on one another, create total distrust across neighborhoods and communities, and report people because of suspicions based upon appearance?" Mahony blamed the Arizona bill ... on the lack of federal comprehensive immigration reform, and on a misguided assumption. ..."Almost all of our immigrant families are `mixed,'" he observed. "That is, some members have legal documents to be here and some members do not. Asking ordinary Americans and over-worked law enforcement officers to hunt down people of suspicious legal documentation is ludicrous and ineffective." Yours Truly highly encourages you to ready more by Stephen Lemons on this subject. It's pretty eye opening. On April 20th, nine brave students chained themselves to the AZ State Capitol to send Gov. 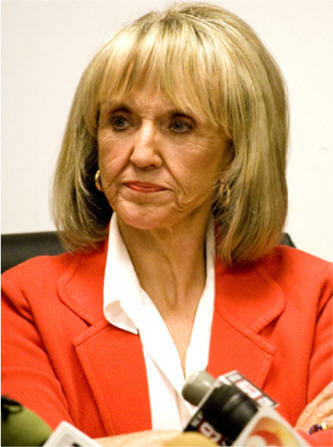 Jan Brewer a clear message: VETO BILL SB 1070.